As July wraps up, we’re sharing 4 “summer in blue looks”. We often talk about summer white, as if it’s the only color we should wear when the weather heats up, but the reality is that summer blues are almost as ubiquitous as summer whites. Summer blues celebrate the bright blue summer sky when our days get longer, allowing us to find a few extra moments for the things we love. With summer rapidly winding down, clothing that captures the spirit and warmth of summer gives us the opportunity to celebrate the waning season and to ensure that we are focused on making memories that we can carry during the cold days still to come. This frilly polka dot dress is fun and flirty. With a subtle cold shoulder, it’s not too revealing and also conveys that relaxed summer vibe. Summer doesn’t have to be all about showing skin. You can still dress for the season with lightweight fabrics that keep you covered and help protect skin from the sun. 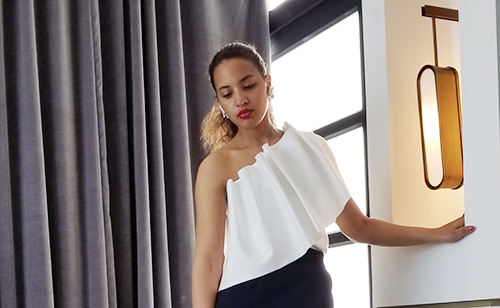 We’re on a ruffle overload, but paired with an asymmetrical skirt keeps the ruffle from taking over. Our final look is all about mixing patterns and textures. Pearls on the leg of the pant mimic the print of the shirt for a classy summer fun look.